I have had the Tama Silverstar Metro Jam kit for almost a month now. My touch is getting better, and I can pretty much do on the Tamas everything I could do on the TD-4. I like them! During shipping a screw came loose inside the shell on the Ludwig, so I had to take the batter head off, fix the screw, and tune it up again. I am starting to get comfortable taking drums apart and tuning them. It is not rocket science. The Ludwig is very dry and very sensitive. It seems to me that it would be good for jazz and brushwork, and it is fun to play rolls on it because it is so responsive. The Kent, on the other hand, has a fatter, mellower sound. To me it sounds more like rock ‘n roll. 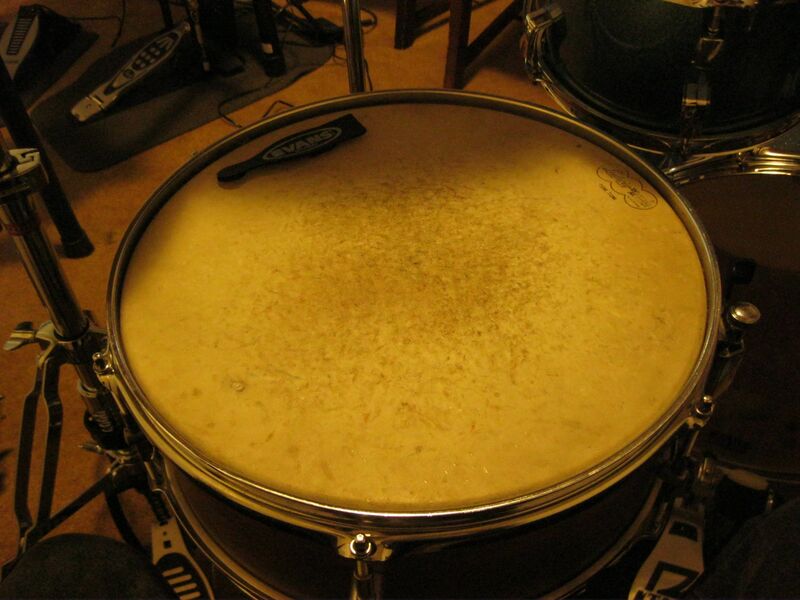 The batter head on it is a Ludwig Weather Master tom head that looks like it has been used on hundreds of gigs. The Kent came with an old Ludwig tom tom head on it. The drum would probably be more focused if I changed the heads, but for now it sounds good and I like the vibe of the old head. These two drums are very different. I have already learned a lot about snare drums from owning and playing them. The Drum Forum (DFO) is a good place to learn about drums and meet other drummers. The members there are mostly pros who have been playing for a living most of their lives. The age factor there probably skews above 40, and there are a lot of vintage enthusiasts. Yesterday I put the little Tama snare back on the stand, and it sounded pretty terrible. However, from working with the other drums I knew that it was not tuned up right, and that the stock heads, which are still not broken in, had stretched. I tuned it up pretty high and it started sounding pretty good. It tends to ring a bit, so I put an Aquarian Studio Ring on it, which is just a ring of plastic that damps down the overtones. 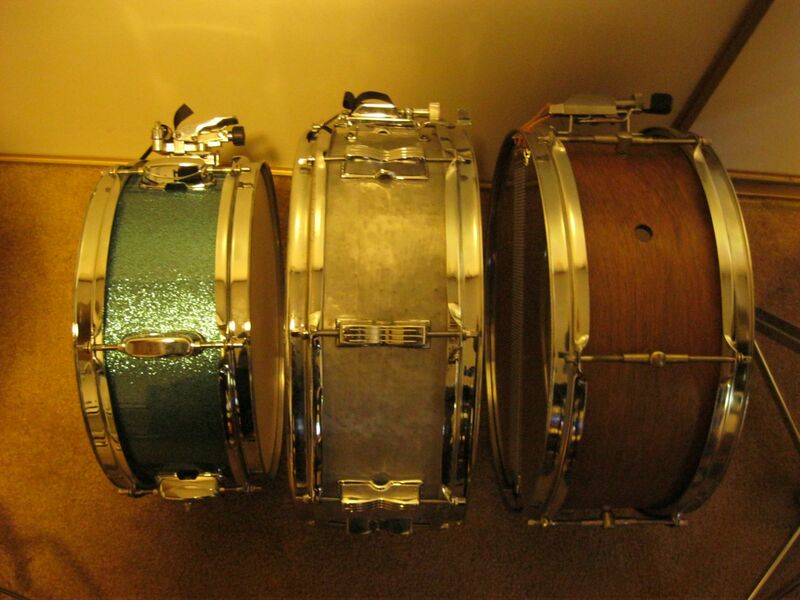 Now I like that snare too. It is smaller, not quite so loud, and the sound is in between the Ludwig and the Kent. According to the serial numbers these were made in 2010, and except for some fingerprints, they do indeed look brand new. They still had barcode stickers on them. 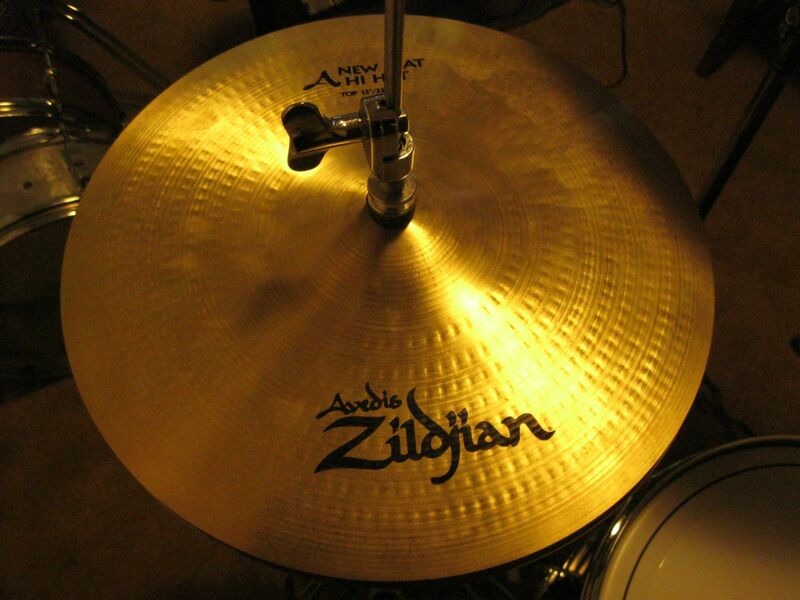 They would not be cool on the DFO site, or on Cymbalholic, where old vintage cymbals and new esoteric ones are popular, and it is hip to scorn new product from Zildjian. However, to me they are crisp and expressive, and exactly what I was looking for. I may buy some more used cymbals this way. Hey Doc, it’s Eric Strege (one of your many students throughout the years). Ryan Sarehkhani and I were talking about sound definition with drums and how difficult it is at times to focus the sound as you were talking about with one of your snares. We discovered a product named Moon Gel, perhaps you’ve heard of it, but it really does tighten up the sound of a snare (you can use it on tom tom heads also). It works a bit like a compressor for a bass or guitar. On a side note, are you playing any shows in the foreseeable future, Ryan and I kinda fantasize about seeing you play live, and would, therefore, be greatly interested in attending any upcoming events. Also, you should check out our band Carbon Atlas on facebook. Hope to hear from ya soon. Moon gel is cool. I usually use gaffer’s tape though because it is cheaper and quite versatile. It doesn’t leave a residue behind, and moon gel sometimes leaves a blue spot if you leave it in one place for a long time, or so I am told. Gaffer’s tape works on cymbals too, if the wash is just a bit much. There is a Radiohead concert up on Austin City Limits. One of the drummers has both moon gel AND gaffer’s tape on his snare. I’m not playing out these days. Craig is playing gigs in Camarillo, but it is too far for me to get there in a timely manner, and my drumming, though improving, is not good enough yet. I’ve got a new mixer coming, so we may do some higher quality recording soon.